The Galileo satellite navigation system will consist of a total of 30 spacecraft in three planes in medium Earth orbit, which will each be occupied by nine satellites, and with three spares satellites distributed on the three orbital planes. At an altitude of 23,616 kilometers and an inclination of 56 degrees, the system will provide accurate positioning data to users as far north as 75 degrees latitude. Although similar in design to the American GPS system and the Russian GLONASS navigation network, Galileo-FOC will be under the control of strictly civilian organizations. Galileo is the first joint program to be shared between the European Space Agency and the European Union. 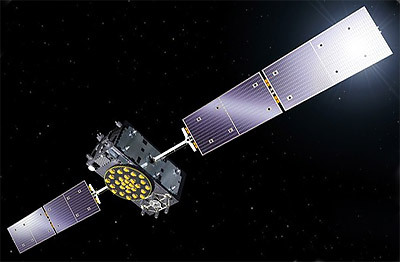 In January 2010 the consortium consisting of OHB-System GmbH and SSTL was selected to built the first 14 Galileo-FOC (Galileo-Full Operational Capability) satellites of the system. OHB-System will act as prime contractor, build the busses while SSTL will provide the payloads. In January 2012, eight more satellites were ordered. The satellites carry a navigation payload consisting of two rubidium and two hydrogen maser atomic clocks. The navigation signals are broadcast on L-band. An additional payload is the MEO SAR search and rescue transponder payload. The first launch of this series ended in a lower than planned orbit. In April 2017, the consortium won an order of eight more satellites. In October 2017, four more were ordered.